digesting politics is a series of communal meals which bring together a diverse group of people to talk about everyday politics. each digesting politics is different, depending on the local context and funding. 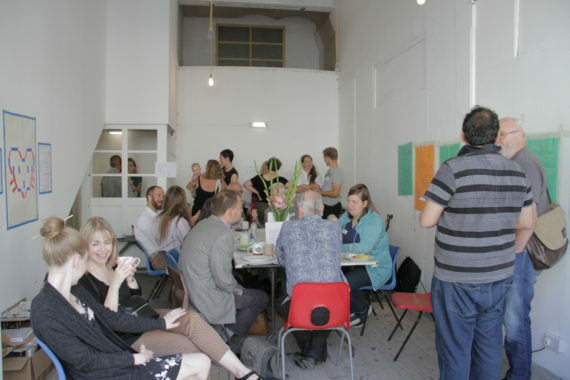 keep it complex is a loose group of artists, arts administrators, designers and other cultural workers. 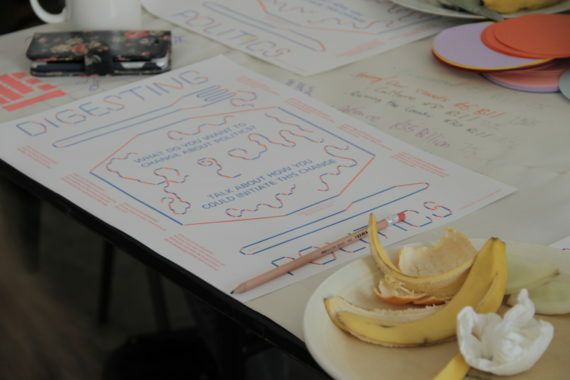 we run a campaign during the EU-UK referendum and organised an arts activation weekend, Unite Against Dividers, in January 2017.
as we all live in London, we are planning to organise most of the digesting politics meal outside of the capital. because we work as a collective, our process is slow and improvised. we also all juggle our money work with our mostly unpaid keep it complex activities. 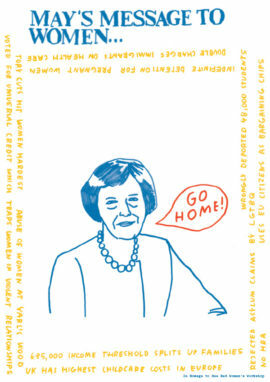 the poster and placemats for digesting politics have been designed by Europa. 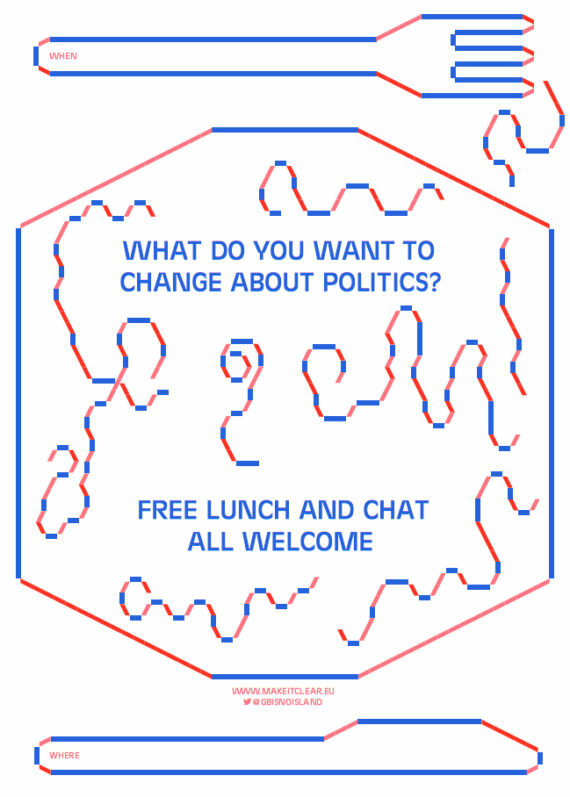 digesting politics is organised by keep it complex members Sarah Jury, Margherita Huntley and Rosalie Schweiker. 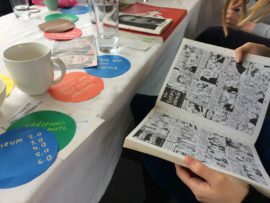 Edinburgh’s Collective gallery kindly hosted one of our Digesting Politics meals, which rounded off their summer school, Ground Meets Horizon. The full reading list for the summer school is here. 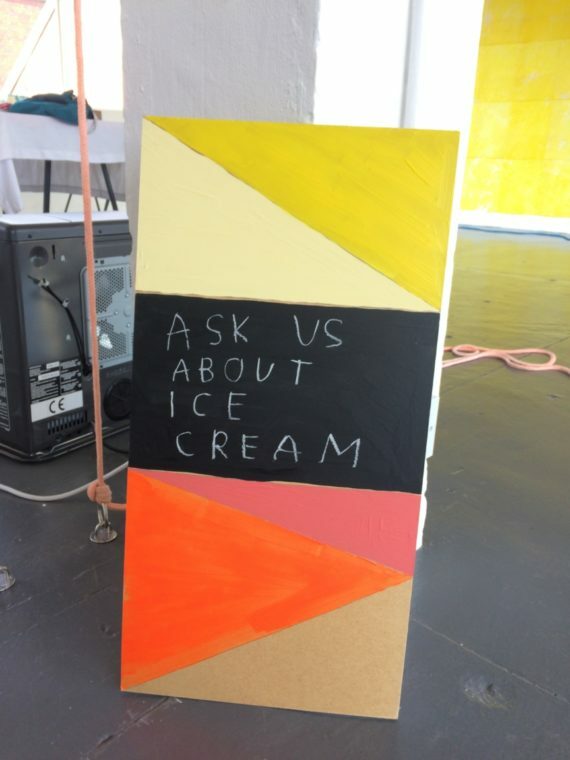 The five day summer school and its guest speakers, including Angela McRobbie and Emma Hedditch, explored the role of art, artists and institutions within political action and activism, and the tensions and possibilities within this. We held a workshop before the meal in which we read a text by Beatrice Warde, which explores the power of the printed word and written text as opposed to the loudspeaker. 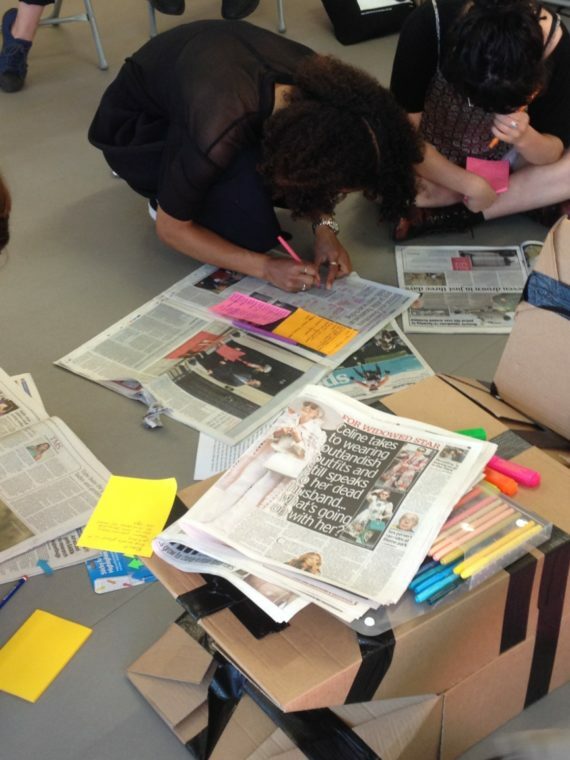 Then we read and dissected the day’s newspapers, discussing how to think critically about the news and how we might be able to challenge how we are presented with it, or interact with those who create it. Keep it Complex presented who owns and runs the newspapers, and introduced some prominent journalists. With the students, we took the newspapers apart, and the students shared opinions on stories they found pertinent. Then we all made salad together! For the first time, we used our new stickers, designed to eliminate awkwardness, which read: “feel free to talk to me”, “I don’t want to talk right now”, and “I’m fine, even though I’m not talking or smiling”. 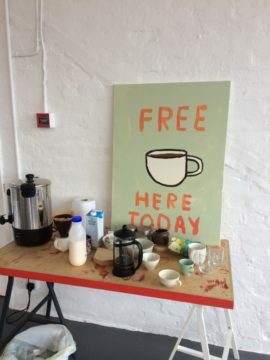 The leftovers were kindly taken by the Edinburgh Student Housing Co-operative. 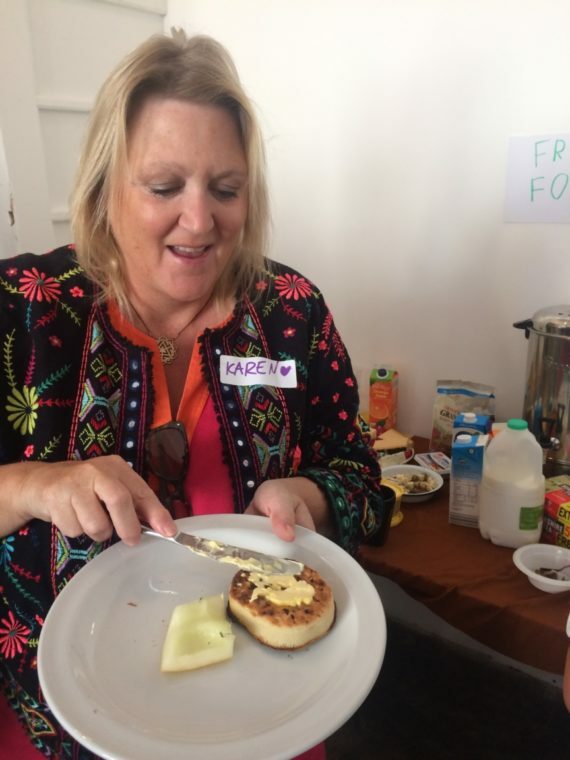 Keep It Complex added a sprinkle of politics to MIMA’s weekly community lunches on 14/12/2017. 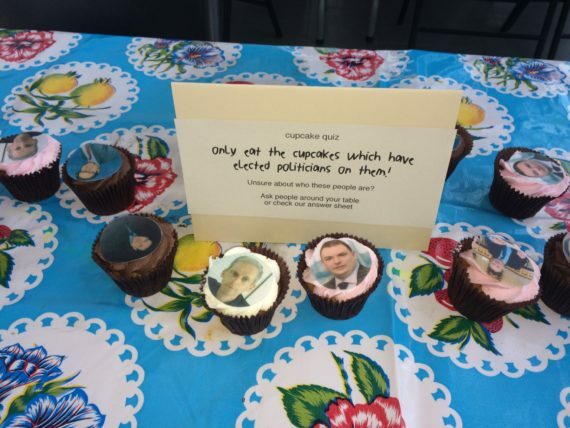 We brought cupcakes with the faces of local politicians, MPs, MEPs, councillors, the police and crime commissioner and the Mayor. 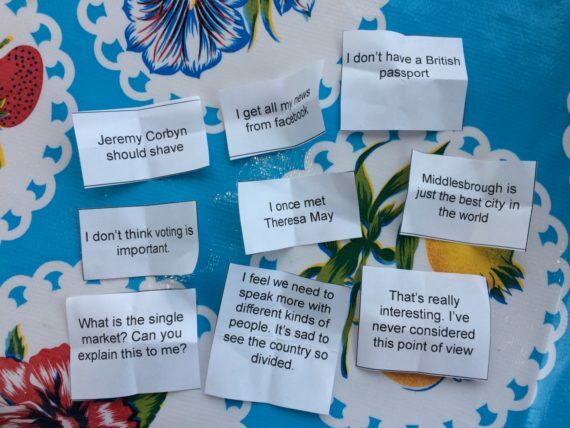 We also gave people pre-digested political opinions: short sentences and words about art and politics, which people took out of a lucky dip bucket. The challenge was to smoothly sneak in your sentence during your lunch time conversation. Here are some of the words we prepared AND some of the words we heard during the community lunch. We won’t tell you which is which – you’ll have to guess. 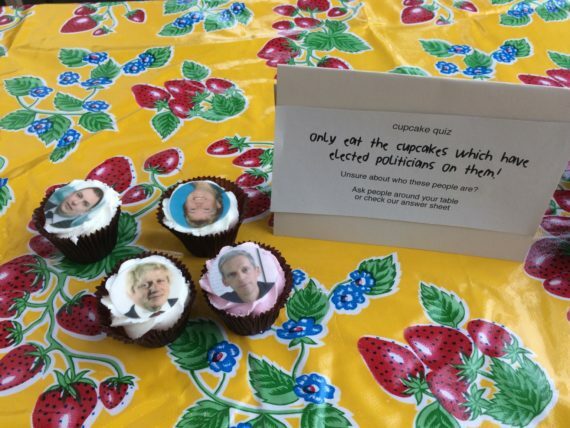 Send us your answers: [email protected] and if you get 90% right, we’ll post you a Michael Gove cupcake. Keep it complex headed up to Birmingham to have some tea and Teressa May cake at Grand Union. Our local supermarket had refused to print Teressa May on a Cake, we’re not sure why, something about not being able to print people they recognize. 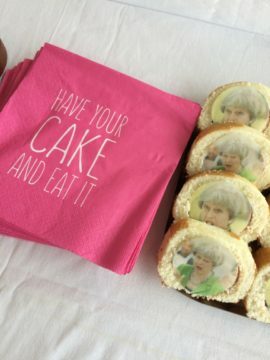 So we sent a photo of Teresa eating to Dave at Eat My Face, and made some great Teresa May cupcakes to get conversation started. 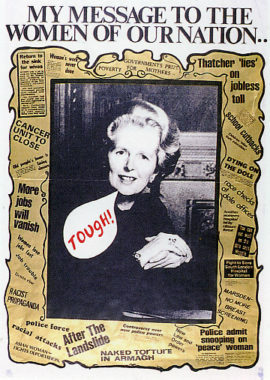 We took up some inspiring books about organizing with others, think like the Seeing Red catalogue about the feminist poster workshops, as well as some local and national newspapers. People looked at these when they didn’t feel like chatting. 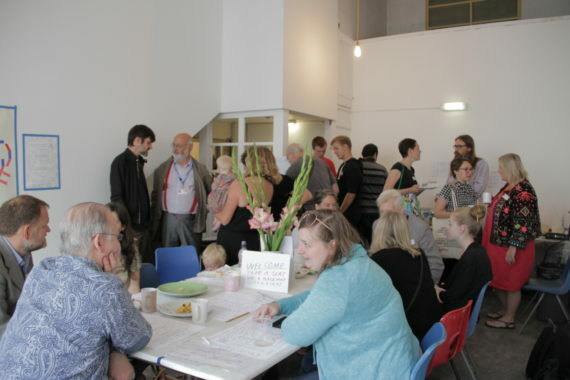 Some people came to chat with Keep it Complex, others joined us after coming to see the current exhibition at Grand Union. 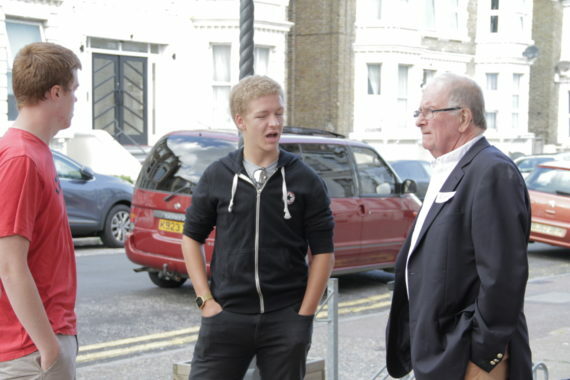 We talked about lots of things including development in Birmingham. One person came all the way from the countryside outside of Birmingham, he wanted to start a political utopia with a flat hierarchy. Someone else wanted to talk about policies at art organizations. Grand Union also made us some cucumber sandwiches, they were great hosts. 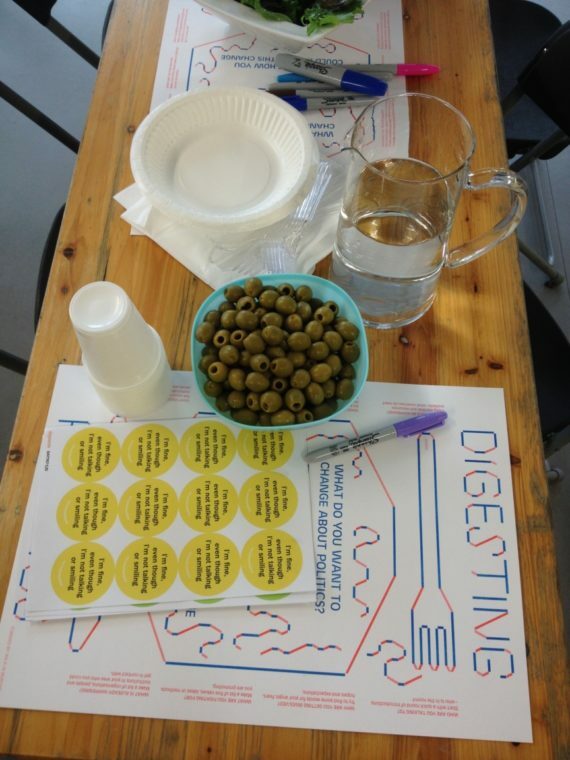 The last of the #DigestingPolitics lunches was run by Company Drinks, a community drinks enterprise based in Barking and Dagenham that links the history of working-class east London families “going picking” to Kent with the set up of a new local drinks company. 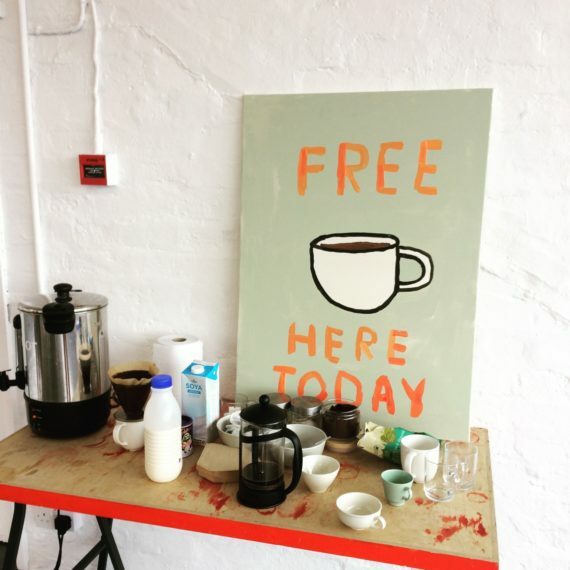 Company Drinks started as an art project set up by Kathrin Böhm from Myvillages, as an invitation to residents across the borough to go picking again, recognising the fact that a lot has changed since the “hopping days”. The geographies and demographics of east London have shifted dramatically, resulting in a less clear division between city and countryside and a much more diverse population. Company Drinks started to talk politics in public during the run up to the UK’s EU referendum in 2016, making a clear connection between the politics practiced and those on a local level (as suggested by the project), with regards to the vote we were given, to decide on the future of national politics. 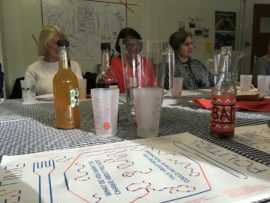 The first public attempt to fuse drinks making with making political opinions was during the ‘Sour Brexit’ production workshop at Dagenham Library in late April 2016. Visitors were invited to make a new drink, mixing English strawberries as a base flavour with cidric acid, to represent the sweetness or sourness they would expect from a possible Brexit vote. 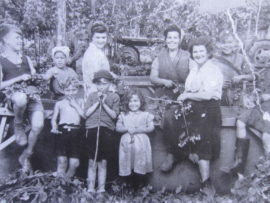 The drink was later served at public events, while the overwhelming public mood in the borough was in preparation for the Leave vote, anticipating the 23rd of June as a new ‘Independence’ Day. 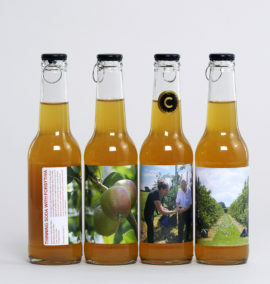 Within the spirit of ‘Keep it Complex – Make it Clear’ Company Drinks sent a mail out with the suggestion that if regulars to their programme enjoy the collaborative, open-minded and collective spirit of Company Drinks, then they should consider voting to Remain. For the first time we made it explicit, that Company Drinks wasn’t just a nice community activity but stood for values that at the time were dangerously demonised as liberal, international and un-patriotic. Company Drinks remains first and foremost a new type of drinks enterprise, merging the social and commercial meaning of the word company, but contentious political topics are made public once in a while, to become part of a discussion around what we are doing collectively, and why. 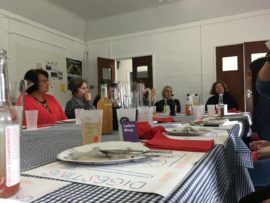 So to host a #DigestingPolitics lunch fitted perfectly, and the decision was made to use a discussion around the politics of food as a starting point, making it fairly easy for everyone around the table to contribute. 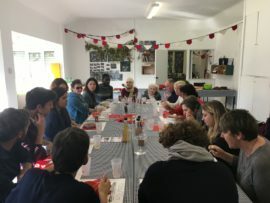 24 people came for the lunch, with everyone having a different connection to Company Drinks, either as a regular picker or volunteer, a local partner, someone connected through a growing or food network and collaborators. 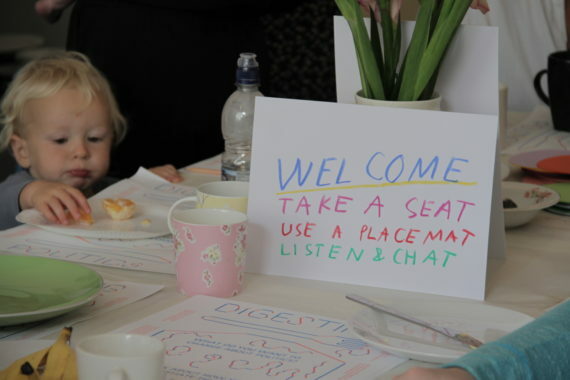 The conversation covered lots – from food waste in supermarkets to the fatally cheap chicken and chips offers near schools. We ate, everyone had their chance to speak, and two hours of discussing as a group passed in no time. It was clear to everyone at the table that this was clearly a starting point. 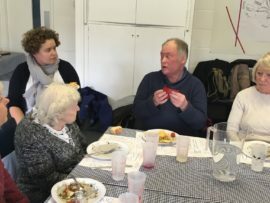 The conversation was shared, different opinions became apparent, no-one was shouting someone else down, there were more surpises than annoyances, and the general feedback was that these rounds should be continued. 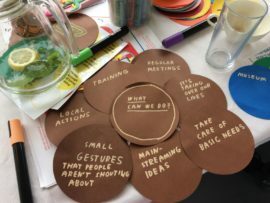 Both as a way of practicing and culturing public conversations around politics between people who don’t share the same opinion, and secondly as a mini forum to work on doable changes when it comes to food politics. As a result, #DigestingPolitics lunches at Company Drinks will continue as a fixed monthly feature around the politics of food, with each lunch resulting in a series of calls to action that can be applied at Company Drinks itself, at everyone’s home and as a collective suggestion to the council to change local politics and to the local MP to lobby on a national level. Dates and topics for the 2018 #DigestingPolitics lunches will be published on the Company Drinks website in early 2018.